WHAT YOUR PATIENTS DON'T KNOW ABOUT UV PROTECTION CAN HURT THEM Is there really that much of a difference between drugstore sunnies and premium sunwear offered by eyecare professionals? You know the correct answer, but most people don't. You can offer your patients the best sun solution with Xperio UV ™ polarized lenses, Essilor's innovative, in- dustry-leading sun lenses that are designed to improve the lives of your patients by providing superior vision protection. Xperio UV polarized lenses are only available through independent eyecare profession- als, which is one of the many ways Essilor demonstrates its commitment to the success of independent optometry. UV Transmission vs. UV Reflection Most people know to look for sunglasses that protect against UV rays—and that's a good place to start. However, there are two ways that harmful UV rays reach the eye. UV transmission is the process of light passing through the front side of the lens. UV reflection is when the light (entering from the side or behind) bounc- es off the back side of the lens and into the eyes. According to a study published in the Journal of Epidemiology, up to 50 percent of harmful UV ray exposure comes through reflection off of the back surface of the lens. Traditional sunglass- es, even those that offer 100 percent UV protection, only offer protection from the front of the lens—that's half of the lens. Explaining to your patients that light enters the eyes from all angles, including the side and back, and that light reflects off the lens, will help make the case for a premium lens that offers full protection. Protecting against both transmission and reflection Xperio UV polarized sun lenses protect against both UV transmission and reflection. The darkness and polarization of Xperio UV polarized lenses protect against 100 percent of front-side UV transmission. An anti-reflective coating on the back side of Xperio UV polarized lenses protects against 98 percent of back-side UV reflection. 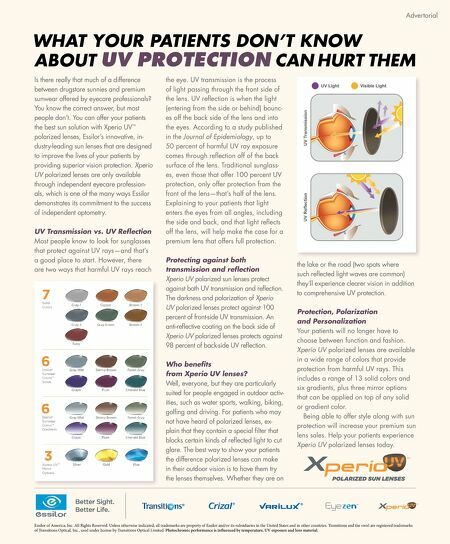 Who benefits from Xperio UV lenses? Well, everyone, but they are particularly suited for people engaged in outdoor activ- ities, such as water sports, walking, biking, golfing and driving. For patients who may not have heard of polarized lenses, ex- plain that they contain a special filter that blocks certain kinds of reflected light to cut glare. The best way to show your patients the difference polarized lenses can make in their outdoor vision is to have them try the lenses themselves. Whether they are on the lake or the road (two spots where such reflected light waves are common) they'll experience clearer vision in addition to comprehensive UV protection. Protection, Polarization and Personalization Your patients will no longer have to choose between function and fashion. Xperio UV polarized lenses are available in a wide range of colors that provide protection from harmful UV rays. This includes a range of 13 solid colors and six gradients, plus three mirror options that can be applied on top of any solid or gradient color. Being able to offer style along with sun protection will increase your premium sun lens sales. 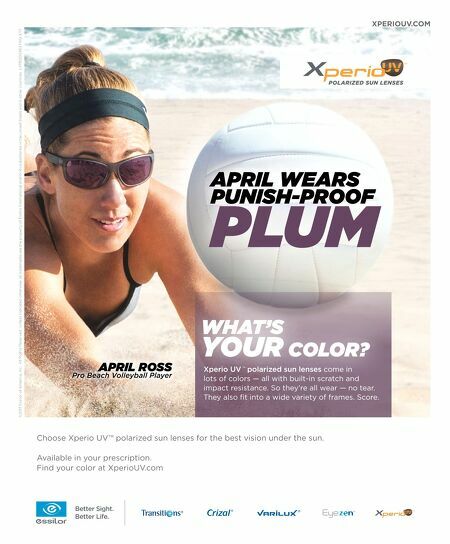 Help your patients experience Xperio UV polarized lenses today. Advertorial Essilor of America, Inc. All Rights Reserved. Unless otherwise indicated, all trademarks are property of Essilor and/or its subsidiaries in the United States and in other countries. Transitions and the swirl are registered trademarks of Transitions Optical, Inc., used under license by Transitions Optical Limited. Photochromic performance is influenced by temperature, UV exposure and lens material.